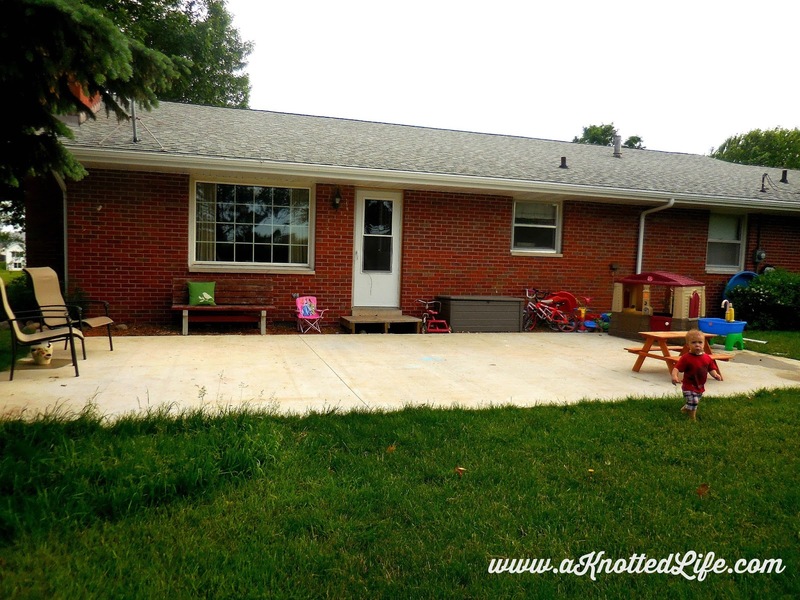 Last week I put the baby down for a nap, slathered sunblock on the other four kiddos, filled up the water sink, pulled the garden rake and spade from the shed, and went to work. For six hours I weeded, transplanted, watered, carried stones, dug, pruned, spread, and arranged. By the end of the day my body was exhausted but I felt fabulous. Obviously the bush is growing in nicely, and we were delighted with the peonies that came up. My neighbor, my mom's friend Patti, and my friend Molly all made some nice donations in hostas and flowers from their own yards. 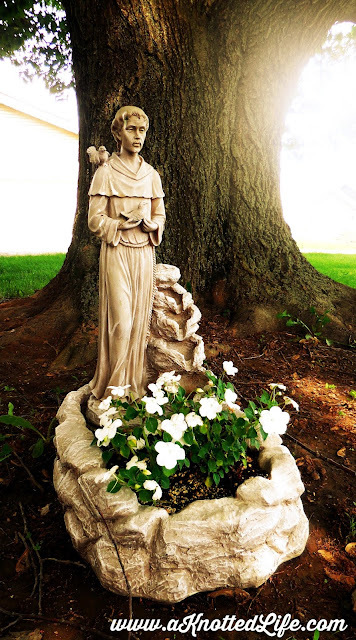 This St. Francis statue sits to the right of the stepping stones pictured above. It's supposed to be a fountain but I like it for a planter. He's got a little bird poop on him, poor guy. The water pump came from our old house, and my husband kindly moved it for me. The rocks came from another friend's landscaping. Last summer they were getting rid of it and offered it to anyone who wanted to move it, for free. Travis spent the better part of an afternoon taking them up and moving them across town. 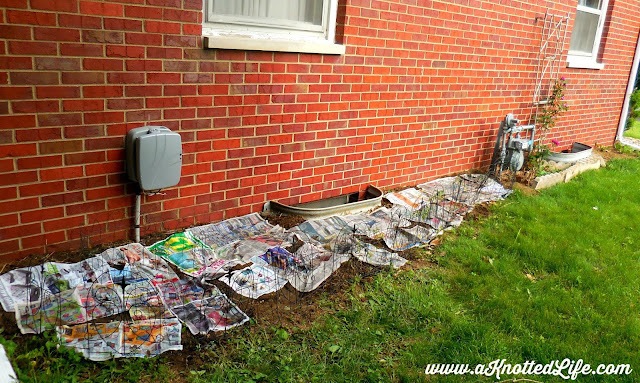 We have enough that I think we can cover all the downspouts, but that job will have to wait for for mulch. The hostas in the corner, the peonies, and the ivy on the chimney were all planted by the original owner. 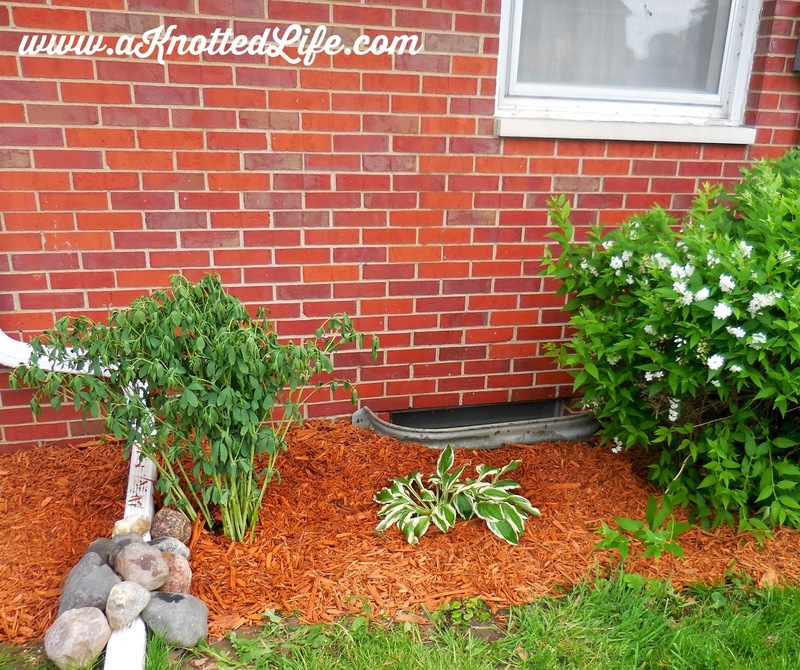 I added some more hostas and the stones. 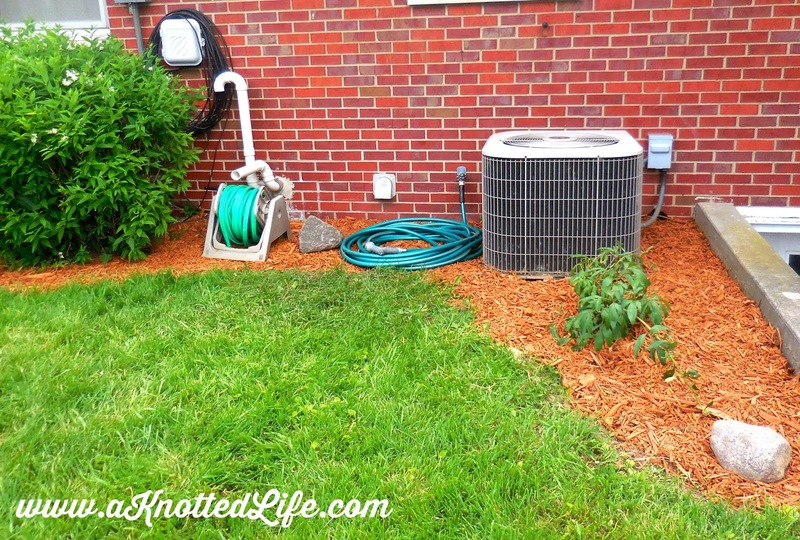 Again, we need mulch through this area but I just can't afford that right now. 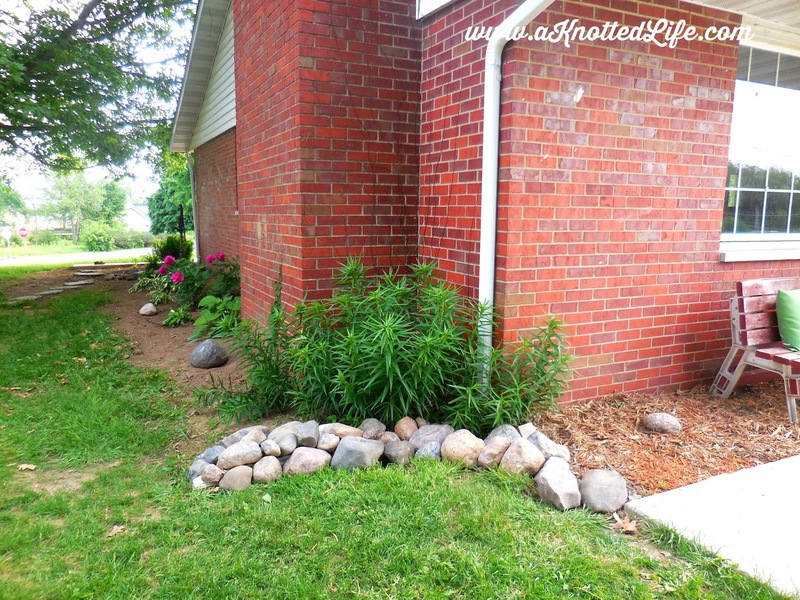 Those lilies also "came with the house" and I did cover this downspout with rocks. I love how it looks. Eventually we'd like to put a sidewalk from the driveway to the patio, one with a nice curve, but like the mulch that will have to wait. I rearranged the patio a bit, too, did some weeding, and laid down new mulch along the back of the house. I've been doing the mulching in sections - $20's worth here, $20's worth there. I still need to paint the bench, and I'm still not sure what color to use. A dark grey? A fun blue? Right now it gets lost against the red brick - you wouldn't even notice it under the picture window if it weren't for that green pillow. The grass is long in the left side because I had staged my pondless waterfall there. I still want to put one in but I'm thinking it's less and less likely. 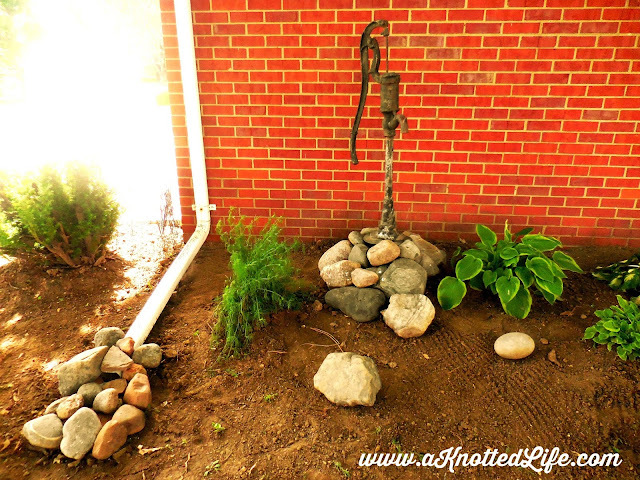 We have the stones for it - the stepping stones from the side yard plus the aforementioned rocks - but the pump and liner and electrical running stuff is pricey. My dream is to then put a fire pit to the right of the waterfall, surrounded by flagstones, but again, price. This little patch of flowerbed is to the right of the patio. The plant on the left was transplanted from elsewhere in our yard. It may not make it. The hosta came from Molly, and the bush was wild when we bought the house but is lovely this spring. This downspout will also be covered in rocks but in a way that ends more like this. Other side of the bush is basically just utility stuff and then a scary drop off to a door that goes into our basement. 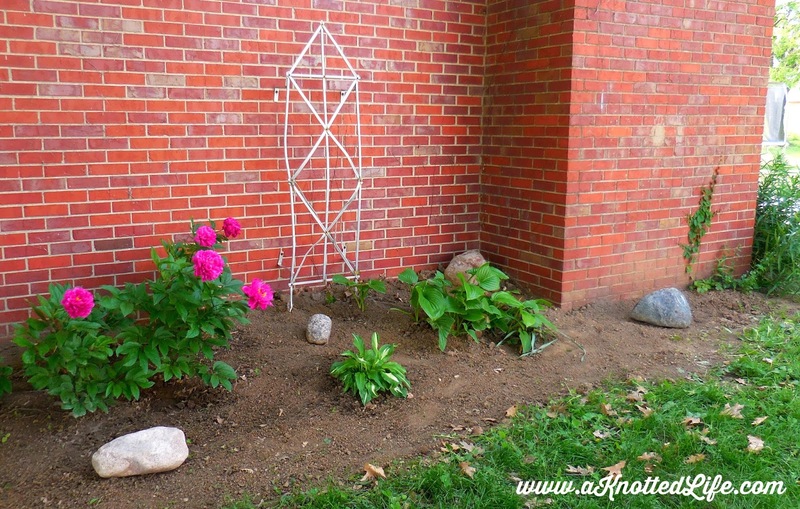 New peony from Molly, new mulch, and more rocks, and I think it looks nice. The other side of the house now has tomato plants, beans, and peas, plus a fence I picked up on from the curb one garbage day. Also, there was a freaking snake in that window-well and when I saw it I screamed so loud my neighbors came running. I was so grateful to the man next door who removed the snake for me and made sure there wasn't a nest. And now I'm linking up with Cari because she's one of my blogging role models and I love looking at people's gardens and the work they've invested in them. It looks beautiful! WOW! You've done alot of work and it shows! Love your St. Francis statue (with or without the poop! :) ) I suggest painting the back patio bench a pretty bright yellow to add bright colors and yellow would like nice with that green pillow. Just my 2 cents :) Way to go! What a huge difference! It looks great! GAH! The difference! It looks amazing! 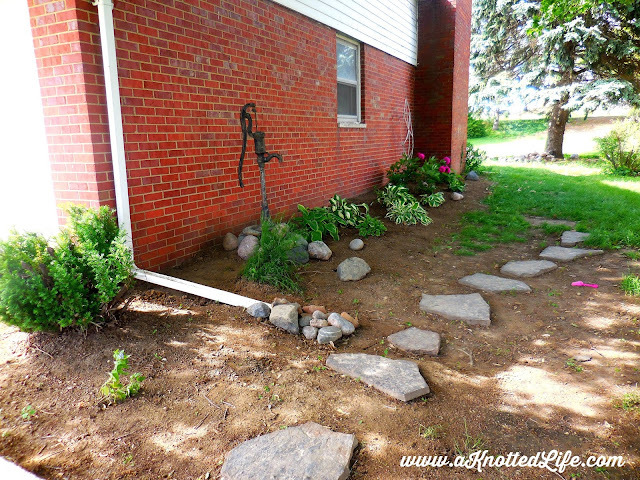 I love, love, love the stepping stone path. I want to put one in my yard so badly- and for zero ninety nine free? Heck yeah! I feel you on the mulch price tag. Ugh. If you have pine trees in your yard/neighbor's yard/playground, you can rake up the pine straw and use that until you fill in with bagged stuff. That's what I did at the old house, and it works really well. Also, that peony? Gorgeous. Can't wait to see those lilies in bloom. And, and, and. WHOA!!! Amazing!! I was going to offer the pine straw idea too! That's what we use! Great work lady! It looks b-e-a-utiful! Wow, what a huge difference! Great job! Hi Bonnie, I read your reflection for Blessed Is She today so that's how I got here. I just wanted to both thank you and encourage you. My husband and I are expecting our second baby (the first one is in Heaven) and due to my extreme morning sickness I had to quit my job months earlier than expected, forcing us to move in with my parents for a time. Your message of being happy with what we do have is so true and so important. I am proud of you for being thrifty and making a huge impact on your yard and garden. Keep it up! There is much more to be proud of when we have to work hard to make something possible.God is blessing you through the flowers and statue and pretty stones. What a beautiful woman you are to create such beauty to reflect Him. I am proud of you. It looks great! I love spending all day outside, making things look beautiful. It is time well spent, in my opinion. I think the bench would look great in blue or grey or yellow like Tracy suggested, but personally I would pick a deep plum or bright coral. I love colorful outdoor furniture.